It takes more than just superb food and an enticing ambiance to get customers into your restaurant. When competing with established eateries and well-funded restaurant chains, you need to directly engage with past and potential patrons to stand a chance. 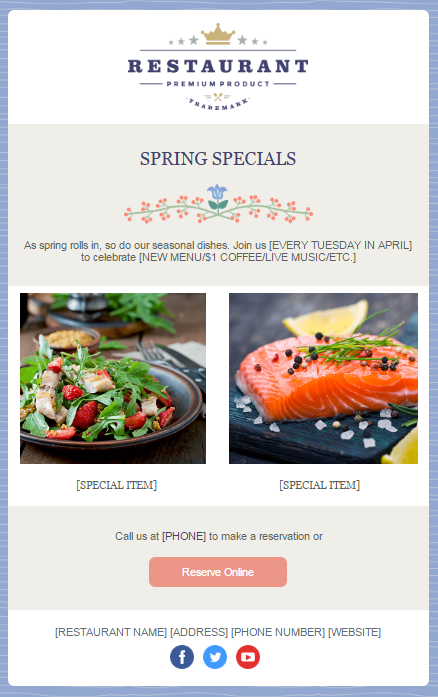 Many restaurants have found success through email marketing, allowing them to keep their places packed even during the offseason. While marketing might seem like the farthest thing from running a restaurant, it actually requires much of the same strategy and skill. Your customers come in with certain appetite preferences, order from your menu, and expect to receive their food while it’s still hot and fresh. Think of your email marketing the same way. Treat you email subscribers like your patrons, and they’ll become patrons. They subscribed to your email list because they want what you’re serving — valuable content and news delivered via email. Make sure you’re ‘cooking up’ what your audience wants, which may include news about your restaurant, menu updates, or even tasty recipes. Tip: Constant Contact has professional email templates designed specifically for restaurants. Try one free for your restaurant! Sign up for a free 60-day email marketing trial. Offer subscribers a peek into your restaurant, and they’ll want to experience the real thing in no time. Need some content ideas to market your restaurant? Try email marketing for your restaurant for free! Sign up for a free 60-day email marketing trial.